With its breeding program, the numbers in the herd are obviously not static, but in 2007, the Ambersun herd was around 1000 in number. 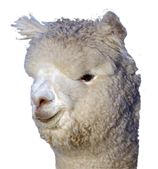 While the majority of these alpacas are registered with the Ambersun herd prefix (ASA), the herd composition includes alpacas registered under Compass (COM), Andamooka (AKA) and Fine Choice Alpacas (FCA), alpaca herds which Chris and Adrienne have between 50 and 100 percent ownership. We are pleased to announce the ''Own your Own'' Breeding Male Auction will go live on 18 July!